Shelter-Rite was an attractive choice because of its proven resistance to high levels of airborne pollutants. 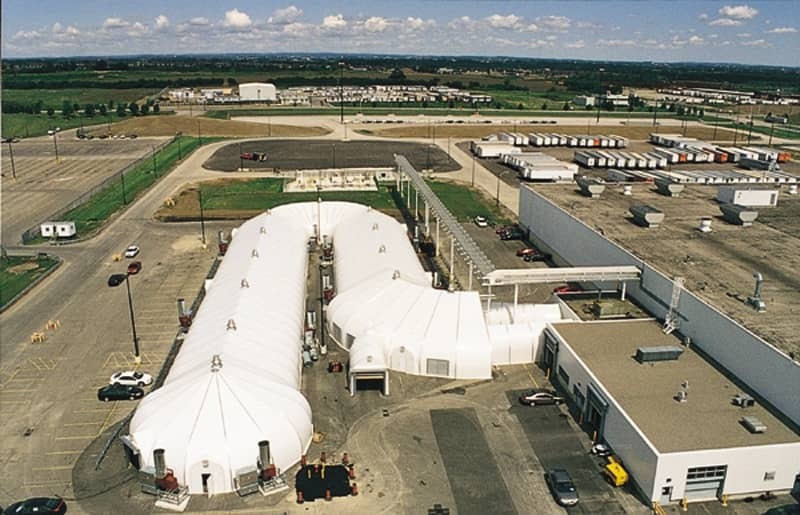 Fabrication and Installation: Sprung Instant Structures, Inc.
A stressed membrane structure provided the solution for a major North American automobile manufacturer that required a permanent, covered test track for production modules. The unusual shape of the sophisticated structure would not have been feasible with conventional construction. However, Sprung Instant Structures Inc., was able to meet the challenge with high quality 24-ounce white PVC coated fabric placed under extremely high tension between a series of aluminum arches. Sprung selected Shelter-Rite® architectural fabric coated with fluoropolymer for the project. Manufactured by Seaman Corporation, the Shelter-Rite fabric membrane consists of a combination of opaque white for the main body and translucent white for a skylight section. Shelter-Rite also was able to meet the need for long-term membrane durability. Because the automotive manufacturing plant is located in a heavy industrial area, Shelter-Rite was an attractive choice because of its proven resistance to high levels of airborne pollutants.